There are a number of books that need no real introduction. Mention the word 'Wisden' and every cricket enthusiast will know precisely what is being discussed. Similarly, a classical music lover will react instantly to the mention of the word 'Groves' and the antique collector to the name 'Lyle'. In railway publishing, there is one but one title that is instantly recognisable in these terms. Mention 'Baker' to anyone with a knowledge of the subject, be it as a professional or as an enthusiast, and immediately they will know without doubt the subject of the conversation. 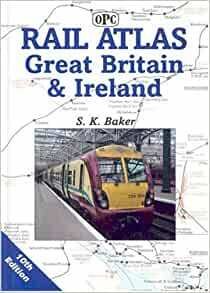 Since it was first published in 1977, Stuart Baker's Rail Atlas Great Britain and Ireland has established itself as one of the must-have books on the subject of the contemporary railway industry. Now into its 10th edition, as well as several reprints, the book is probably one of the best-selling railway titles of the time. The ninth edition of the book was published in 2000 and in the four years since that edition was compiled, much has happened to the railway infrastructure of the British Isles. The first section of the country's first purpose-built high-speed line, linking London to the Channel Tunnel, has been completed and work of the West Coast modernisation plan continue apace. Newly electrified routes, such as that from Crewe to Stoke, feature as do the virtually complete Light Rail schemes for Dublin and Nottingham. An essential work of reference for both railway professionals and enthusiasts, the ninth edition quickly sold out and was rapidly reprinted. This new and fully revised 10th edition is certain to sell as well as previous editions. This the latest version, the first was in 1977. It has all the latest developments and many of the plans which enable the enthusiast to check out where they are on their journey. What is surprising is the vast amount of freight facilities that exist and the large number of Civil Engineer sidings in all sorts of odd corners. As it states in the introduction the amount of rail development over the next twenty years or so in the UK is probably at an all time high in the last 150 years! It is compact enough to carry round, with enlarged areas where there area lot of lines. I note it also includes Ireland these days as well. It does not have historic information but a copy of Cobb's Historical Atlas fulfills that need but is hardly portable! On the back it says "essential reference for both enthusiast and professionals" and I agree. This new edition shows a lot of the hoped-for new developments in the British and Irish railways systems, which is very useful, but how many of them will materiaize on the ground remains to be seen. I remember after world war 2 the maps of the London underground system showed lines that were never built. I found the fit of this product particularly pleasing. Goes well with my other evening wear and will compliment most shoes in my wardrobe. The instructions are a bit hard to understand but once I had mastered them, I was cooking on gas. It's a shame about many of the mistakes in this book, sometimes quite silly mistakes such as wrong colours. My husband loves it and is making lots of plans to explore. Keeps him out of mischief! Definitive reference work. Rarely read a railway magazine without referring to it.